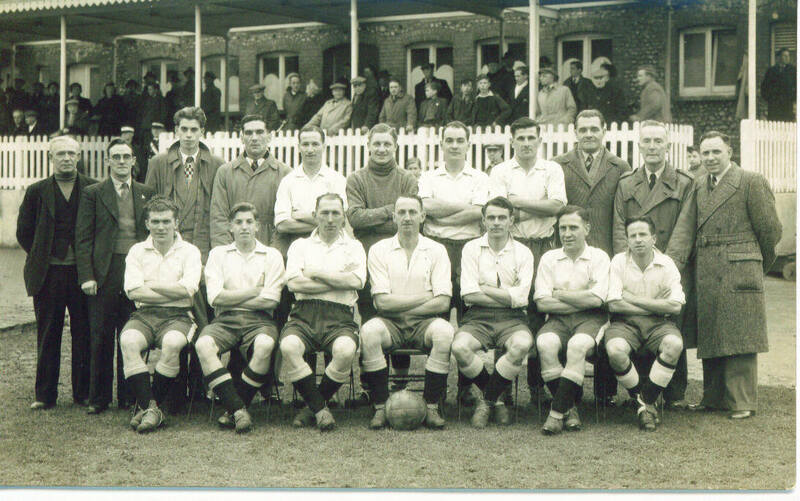 The Dover Reserves side, pictured in front of the pavilion on the 14th.January, 1950, before the Kent League Division II match against Canterbury City Reserves. Back row (left to right): H.Husk, A.Buzan, Jackie Broadbent, Les Smith, Sid Ives, Frank Rowden, Hatto, Hogben, Tom Lynch(Chairman, Supporters' Association), A.B.Constable(Director), C.Hearne(Director). Front row: Gilson, Peter Broadbent, Billy Scott, Geoff Wright(captain), Ken Lister, Bazen, Horton.